We have been lying for decades. The terrible truth is that the Gods have fallen silent. Only thieves and liars speak for them now. The prophecies you hear are nothing but a desperate attempt to rally our forces. You see that chaos rules Necropolis now. You know the Camarilla is doomed. * An epic, companion Chronicle to Requiem for Rome, that’s detailing the end of the last great unified society of vampires. A comprehensive resource for Storytellers to run the chronicle from the very first sign of trouble to the calamitous finale a hundred years later! * Rules to allow players to play the chronicle from multiple perspectives as heroes of the doomed Camarilla or instigators of the final collapse. Detailed scenes allow them to take advantage of political opportunity to seize power and steer history, indulge in decadent escape unparalleled in modern nights, or bathe in the blood of their hated enemies. * New information about the true origins of three of the modern covenants are included in scenes allowing players to witness the spectacle of ancient betrayal and inspiration. Includes new rules for arena competition, blood magic rituals, and a resource for running Chronicles set in Byzantium, the first true seat of Sanctified power. 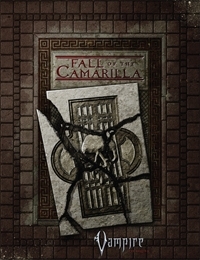 Fall of the Camarilla is a supplement for the World of Darkness game Vampire: The Requiem. This title was added to our catalog on January 23, 2008.